Although many Civil War reference books exist, Civil War researchers have until now had no single compendium to consult on important details about the combatant states (and territories). 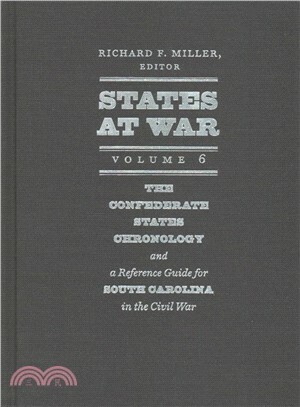 This crucial reference work, the sixth in the States at War series, provides vital information on the organization, activities, economies, demographics, and laws of Civil War South Carolina. This volume also includes the Confederate States Chronology. Miller enlists multiple sources, including the statutes, Journals of Congress, departmental reports, general orders from Richmond and state legislatures, and others, to illustrate the rise and fall of the Confederacy. In chronological order, he presents the national laws intended to harness its manpower and resources for war, the harsh realities of foreign diplomacy, the blockade, and the costs of states’ rights governance, along with mounting dissent; the effects of massive debt financing, inflation, and loss of credit; and a growing raggedness within the ranks of its army. The chronology provides a factual framework for one of history’s greatest ironies: in the end, the war to preserve slavery could not be won while 35 percent of the population was enslaved. RICHARD F. MILLER is the author of In Words and Deeds: Battle Speeches in History, Fighting Words: Persuasive Strategies for War and Politics, and Harvard’s Civil War: The History of the Twentieth Massachusetts Volunteer Infantry. He is an independent scholar.